We need as many of the wedding party and readers there as possible. We run through the ceremony and work out where we will stand etc. I arrive half an hour before the ceremony time. I present you with your marriage certificate in an envelope also containing a copy of your ceremony for your album and an application form for obtaining a copy of your registered certificate for proof of change of name on legal documents. Efficient completion and lodgement of all required forms. Official paperwork is lodged at the Registry of Births, Deaths and Marriages in the State where the wedding takes place. At the first meeting. . .
We sign a Notice of Intended Marriage together at least one calendar month before the wedding and no earlier than eighteen months. You need to show me proof of birth�?your birth certificate or an overseas passport [if you were not born in Australia]. Also evidence of the end of a former marriage must be provided [certificate of divorce or death certificate]. I can provide you with recommendations to other wedding specialists. 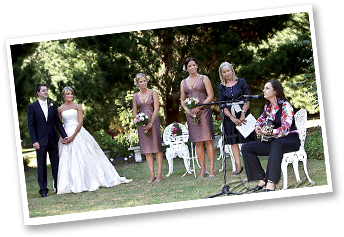 We start to talk about ceremony ideas and I get a feel for your values and the kind of ceremony you would like. I give you the wedding pack of fabulous material to put together your ceremony including a wide choice of ceremonies and, many of which are quite original. This enables you to design your own unique ceremony with as much help from me as you need and we weave your story through it. Deposit is paid and I give you your booking in writing. Before the rehearsal you email me your ceremony or we meet together to finalize it.